Our custom telescope bags allow convenient and stylish transportation of your Tele Vue telescope. 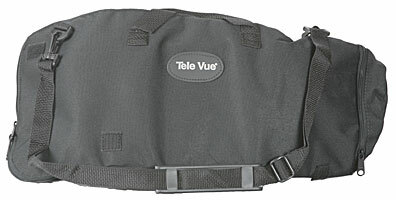 Padded carry case shown holding TV-60 with optional eyepieces, diagonal and mounting hardware. These bags fit the discontinued Tele Vue Ranger telescope. Black fitted bag allows viewing by unzipping both ends to expose the eyepiece and objective. Gray shoulder bag has a zippered pocket for accessories.